In our continuing working relationship with the National Center for Organizational Continuity (NCOC), BlackOut recently had an opportunity to develop an industry sell sheet to help the NCOC promote its mission and services at a business continuity conference in New Orleans this week. 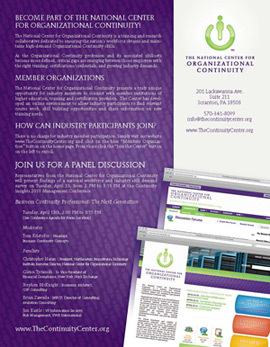 NCOC staff will attend the the Eighth Annual Continuity Insights Management Conference, April 12-14, and will participate in a panel discussion, “Business Continuity Professional: The Next Generation,” on Tuesday, April 13, from 2-3:15 p.m.
BlackOut designed informational fliers with details on joining the NCOC as a member organizations or industry participant, as well as the goals of the center and how to contact them for more information. The Continuity Insights conference will be a great opportunity for the NCOC to introduce industry professionals to wealth of services they offer and we’re proud that they chose BlackOut to help them make a lasting first impression.